I did two coats of the "watermelon" and "tiffany" on alternating nails and then once dry added two coats of the Opal topcoat. Like all flakies, it had a little texture to it so to smooth this out I finished with a topcoat. I used my Color Club one as frankly, it's my favourite! Swatch & Review: Nelly Polish "Bodmin"
Swatch & Review: Nail Lacquer UK "Grape Juice"
Swatch & Review: Nelly Polish "Beeny"
Deborah Lippmann Love: Sparkly Tips! 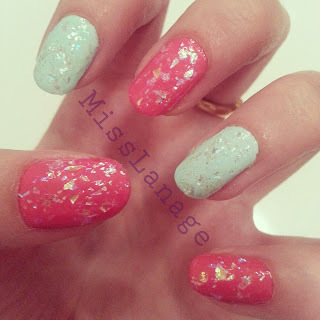 British Indie by Nail Lacquer UK: Bring Me Love!